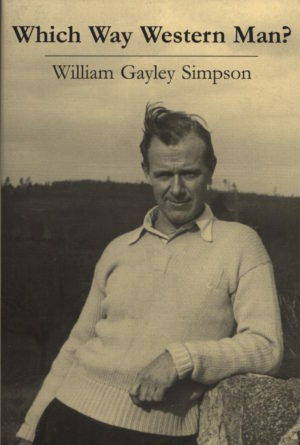 William Gayley Simpson, National Alliance member and author of Which Way, Western Man? TRUE RELIGION is not impractical. True religion is not “pie in the sky in the sweet bye and bye.” True religion is not “love thy invader and hate thyself.” True religion is not Jesus and not the bloody, genocidal Torah. True religion is something we as a people must rediscover if we are to survive. And it is something that will make us incomparably stronger as a race. It is something that will steer us on our true path toward the stars. 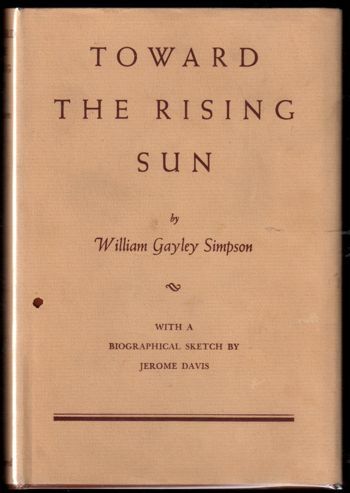 No man offered deeper insights on true religion, and on the shape that the White society of the future should take, than William Gayley Simpson. A profoundly religious and philosophical man, he went from an earnest advocate of Christian ideals — to an understanding of the revolutionary philosophy of Nietzsche — to a vision of our race’s place in the evolution of Life and consciousness that can only be called Cosmotheist. 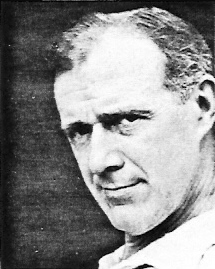 [The Christian concentration on the allegedly] spiritual… meant an indifference to, and a neglect of, physical relatedness in all its aspects — family kinship, gratitude and obligation to one’s ancestors, identification with one’s kind by which one feels oneself differentiated from all other kinds of human beings, and under the pull and direction of which identity every member should undertake with the rest of his kind to preserve an indissoluble bond, so that in every hour of peril and crisis they should unite to form a solid fighting phalanx against every common foe. Jesus’ neglect of every sort of physical relatedness left the soil quite untended against the invasion of the rank weed of the doctrine of human equality, as soon as a shift in the winds began to carry the seeds of it into lands taken over by Christianity. Our air is fairly filled with the floating seeds of this detestable doctrine: “one man is as good as another; the differences that are hereditary, that are handed down from father to son, and that run in families—are of no consequence.” “Why should we bow before the will of a king? What is an aristocracy but a useless and costly burden? Why should there not be the same law for the high as for the low, for the low as for the high? Why should there any longer be any ‘high’? Should not we all, one as much as another, have the right to judge, to decide, and to rule? Should not he who rules, rule by our will, with our permission, as our servant and subject to our approval?” Thus men have said within themselves and to one another. And thus, certainly, it has worked out, and is working out more and more. The suffrage has been pushed down ever deeper into the social mass until now every ignoramus, nitwit, and trifler can have his share in determining the direction of a people. [And the Jewish media manipulators find it easy to control such beings.] “Democracy” we call it, and are proud thereof, and we even fancy ourselves its missionaries to all the world. But some of the better informed among us are convinced that Democracy is always a symptom of approaching dissolution. “The gospel of the ‘lowly’ — lowers,” observed Nietzsche, and every day we see his insight confirmed. As more and more power is yielded to the Mob, the national taste approaches ever closer to the gutter — political corruption is the worst in our history — and our statesmanship is a contemptible fiasco when it is not downright treason. The Mob, unwilling to endure a real ruler, and unable to rule itself, lurches on like a drunken man toward the inevitable ditch. For men are not equal. And the best should rule. And when a people prevents their rule, the end is destruction. I must recognize, finally, a steadily deepening sense within me that there is something unnatural, unhealthy, unbecoming, and indeed something shameful and ominous about our having taken our religion, or even professing and trying to take it, from Jesus. For a people’s religion should come out of its own blood. It should be its own innermost soul made manifest, the elevation before its eyes of its own hopes and dreams, and of the lessons it has learned through its own immemorial experience. Only when this is so will the living instinct of the people say Amen to the command of its seers, and willingly bend to their bidding. And only so will they stand or fall, as they ought, by what intrinsically they are. This means that such a thing as a universal religion is an utter impossibility. The first business of any religion is to see to it that the people who believe in it survive, and not only survive but come to flower and to fulfillment. And so long as great blocks of human beings continue to be so widely and deeply different as they are now — in their needs, and in what seems to them true and beautiful, high and low, and worthy and worthwhile — it is inconceivable that any one religion can prove acceptable or wholesome for them all. This only becomes the more certain when one realizes that these differences in peoples commonly reflect the differences in their habitat, to which they are tied, [and therefore in their biology and evolution — ] and are registered in their very physical and mental constitution. It takes only the reading of such a book as Professor Hans F.K. Guenther’s The Religious Attitudes of the Indo-Europeans to make one realize that in the long run no people can flourish, or even long maintain itself, unless it lives with and by a religion that [was formed] according to its own nature and to the ways of working of its own mind and soul. 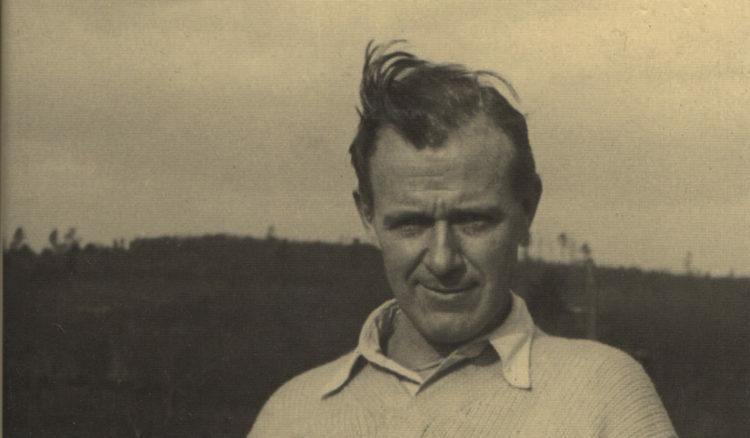 He opens one’s eyes also to the fact that Christianity, basically, is not in accord with the instincts, values, and traditions that have found expression in Aryan man’s various religions, over a period of thousands of years, from the Indus to the Atlantic. And surely this is understandable enough. For it is at once obvious, if we but stop to think about it, that to us Jesus was an alien [ — a Jew]. All the societies that have proved soundly established have been like an organism in their structure. There is differentiation of function. As an animal has eyes to see and to distinguish friend, foe, and food; brain to determine appropriate action in regard to each; fangs and claws for attack and defense; digestive system to make nutriment available, circulatory system to carry it where needed, and excretory system to dispose of the wastes; and finally feet to bear the whole load of the body wherever the brain or instinct wills it shall go, so in the sound human society there is a rough division of the population according to capability and function. Some grow or make, some distribute, some fight and rule, while a comparative few, above all the rest, inspire, guide, and direct. The full necessity of the axiocratic, pyramidal organization of society, with a true aristocracy of profoundly and indubitably superior men at its apex, becomes evident only as we realize that all the significance attaching to human existence traces back to the minds and souls of great persons — great seers, artists, philosophers, poets, composers, scientists, rulers, inventors. These alone create culture. Moreover, all the external changes in society swing, in the last analysis, on the invisible, intangible changes in men’s ideas and values. Not he who changes the form of society renders the most valuable service, but he who most makes men think and aspire, who penetrates deepest beneath the surface of life and farthest into the future. The seer, the philosopher, and the artist in the long run have profounder influence than the statesman and the reformer. It is only in what is, ultimately, a religion that such a society could find its origin, and only religion that could sustain it in life, and in health, and in growth. That is why it is, precisely, that if any society is to maintain and to extend itself in the face of its environment and its enemies, and to attain the heights of cultural greatness, it must have at its helm those of its number who are of profoundest wisdom and of most exalted character, men of deep religious experience [ — experience of a type far beyond the shallow platitudes and superstitions of the Churches today]. Standing apart, freed from the narrow cares and anxieties and little duties that burden and fret the rest, and with disinterested and exalted motives, as it were from a conning tower, [such leaders] scan the horizon, study the stars, and set the course of the ship. The fate of everybody on board rests on their wisdom, their love, and their strength…. It is the duty of an aristocracy to hang stars over a people, and to lift up their eyes thereunto; to set high lands before them, and to lay out a path by which they may climb thither. Our way to a new aristocracy lies through chaos. We shall first have to become ashes before the phoenix of a new nobility shall arise in our midst. But if the world holds together, there will at last be those, a few, always a few, who will again start the old long climb toward the heights, and again lay out the road to a world in which superiority of every sort shall thrive. Are there among my listeners one hundred — or one hundred thousand — White men and women who comprehend the need for a religion based on the ascertained facts of Nature? — who understand that only religion, and only true religion, can give the best minds of our race the purpose and focus that can lead us to our true destiny? — who understand that, at this moment of peril for our race, nothing short of a total commitment to that purpose will suffice if we are to avoid extinction? — who understand that our race’s spiritual childhood is now at an end? — who can see that we must now face squarely the dangers and responsibilities of adulthood? — and who know deep in their race-souls that we who do comprehend these truths must now separate ourselves from those who will be left behind, and bring into being a new people on this planet? Even before the Jewish corruption of that system, under the old aristocracy a foolish son who got all the bad genes from both sides of a noble’s family was still a ‘Lord,’ while a far superior man was sometimes assigned to shine his boots. But an aristocracy something like a holy order, created for the purpose of leading a society that had upward evolution as its purpose, with very selective criteria for membership and training from birth in its severe duties — that would be an aristocracy worth having. In future programs in this series we will continue exploring the new spiritual path for our race — the revolutionary Nature-based religion of Cosmotheism, coming up right here on American Dissident Voices.